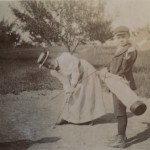 Home » History » Another Butler legacy: golf in Delaware County! Another Butler legacy: golf in Delaware County! After meeting the Butlers’ grandson, Clifford Butler Lewis, I remembered that article, and asked him if that was the same Eleanor Reed as his grandmother. 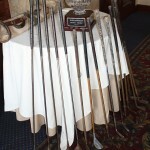 He did not know of Springhaven, but he did have his grandparents’ antique golf clubs! 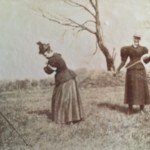 We contacted Springhaven to see if this was the same Eleanor Reed, and were delighted with what we learned – not only was Eleanor Reed Butler a founder of Springhaven, they hold an annual Eleanor Reed tournament in her honor! Just as Cliff had not known about his grandparents’ involvement in the founding of Springhaven, Springhaven had not known of the Butlers’ other legacy, Glen Providence Park. Both Eleanor and George Butler are featured in the preface to The History of the Springhaven Club 1896-2004: “In November 1896, when Miss Eleanor Reed hit the first golf shot off the first tee at “Five Points,” Springhaven was launched. 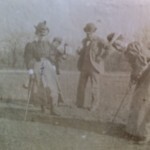 She was joined in that first foursome by Dr. Casper T. Miller, Henry P. Dixon and young George T. Butler. It is said that Eleanor let George win that day and it was only months until they became engaged and later married.“ How fun that romance is part of the story! George became the first president of the club, and Eleanor the first secretary. There were only four golf clubs in the Philadelphia region at the time, about eighty in the United States, and none in Delaware County. The Merion Golf Club was also founded in 1896, in Montgomery County – it did not move to its current location in Delaware County until 1912. 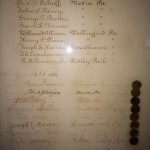 Springhaven remained at Five Points in Media for eight years until it moved to Nether Providence in 1904, and is indeed the first golf club in Delaware County. George and Eleanor Butler were married in 1902 and had one daughter Mary, Cliff’s mother. In 1905, they moved to the John M. Broomall house in Media, connected to the land that would become the park. In 1935, the Butlers donated the majority of the land to Delaware County for Glen Providence Park, as a Bird Sanctuary and Arboretum. Cliff Lewis generously decided to donate his grandparents’ golf clubs to The Springhaven Club, where the Butlers had very likely used them! 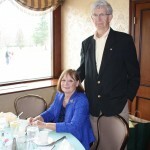 Appropriately enough, Springhaven invited Cliff to do so at the annual Eleanor Reed tournament luncheon in April. 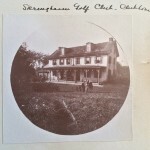 Cliff brought more treasures with him: he loaned his grandmother’s photo albums, including photos of the original club house at Five Points, of his grandmother playing golf, and of other Springhaven founders! 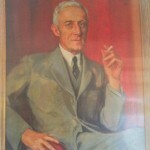 He also brought an image of a wonderful portrait of his grandfather George T. Butler. I was honored to attend the luncheon with Cliff and his wife Chris. Cliff shared engaging stories and photographs of his grandparents. 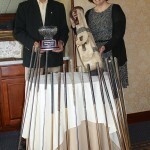 He had intended to donate the golf clubs to the United States Golf Association Museum in New Jersey, but was happy that he learned of Springhaven before he did! It was wonderful to see these pieces of history connected, and to see the golf clubs find their home. It is remarkable to think that George and Eleanor Butler had two such lasting legacies in Delaware County – The Springhaven Club and Glen Providence Park. Thank you to Cliff Lewis for sharing his grandmother’s photographs and for being so thoughtful to include me at the luncheon, and to Bonni DiRenzi and Jim Galvano of The Springhaven Club for their graciousness and hospitality. Read more about Eleanor Reed Butler in our article about the waterfall that is dedicated to her in Glen Providence Park. 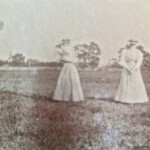 You can see some of the photographs from Eleanor Butler’s photo albums, and from the luncheon, below! Just click on any photo for a closer look. – Eleanor Reed Butler’s photo albums! Thank you for your comment – I am glad you enjoyed the article, and that you have fond memories of time with your uncle at this lovely and historical club. Hello, I am trying to find the life dates (years) for Eleanor Reed Butler for an essay I am writing on country clubs in the Philadelphia area. 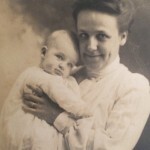 I wonder if you have come across them or might be able to connect with her grandson, whom you mention in this article. Thank you. The obituary for Eleanor Reed Butler shows she died on November 1, 1945. The numbers indicating her age are not clear – it appears she was 74, so she would have been born around 1871. She married George Butler on June 3, 1902. I could email Clifford Lewis – are you writing the essay for West Chester University? I will be interested to read your essay! 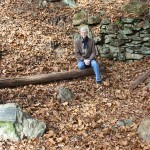 Dear Stephanie: I am an historian writing an article about the Broomall Rock Shelters. Clifford Lewis’s mother, Mary Butler Lewis, excavated this site in the 1940s. I would like to get in touch with her son, Clifford, but I cannot find him. Might you be able to pass this request on to him, with my email address? A recent UPenn article on Dr. Butler, as she was listed professionally, gives the wrong Butler as her father, which should also be corrected. Hi Kathleen, Thank you for your message! I will send your request to Clifford Lewis. I would be interested to see the UPenn article, and I look forward to reading yours. Are you contacting the author of the UPenn article about the correct father?